March is Women's History Month, and as the month comes to a close this week, Take Two is looking into the stories of a few significant women in L.A. history, including Alice Stebbins Wells. 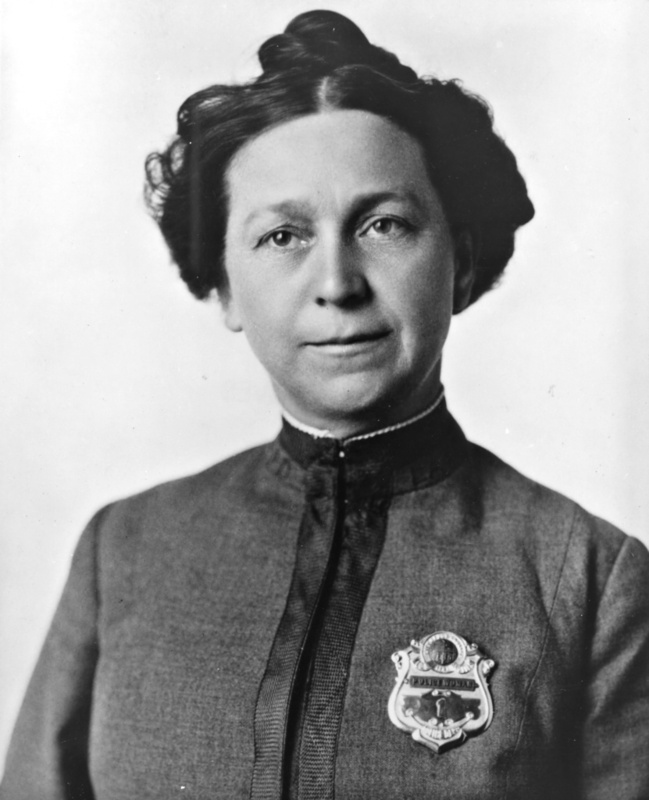 Wells was the first woman police officer with the Los Angeles Police Department, and one of the first woman officers in the country. Bob Taylor is with the Los Angeles Police Museum. Wells came to L.A. from the Midwest, according to Bob Taylor, with the Los Angeles Police Museum. She was trained as a minister so she was well-educated and developed a following with her religious work in Los Angeles. In 1909, Wells presented a petition to the Police Commission and the City Council explaining why L.A. needed women in the police department to work with women and children in the community. Her argument was strong and after some debate among the officials, Wells became the first woman police officer. Being the first policewoman in the LAPD wasn't easy, Taylor said. As the only woman on the force, she couldn't get her uniform from the store where the rest of the officers, so she made her own uniform, Taylor said. It was a long olive skirt and a coat, to which she added some embroidered detail, but the uniform wasn't the only problem for Wells, Taylor said. They gave her a badge, and the badge said 'policeman' because there were no policewomen. So frequently in the 1900s, 1910s, 1920s, police officers used to ride the streetcar. They didn't have to pay a fee. They just showed the conductor their badge. And so when Alice showed the conductor her badge, he said, 'Nice try, lady. You're using your husband's badge to try and get on?' She said, 'No, its my badge, I'm a policewoman.' She went back and reported that to the chief and then they made a badge for her that specifically said policewoman, and it said policewoman number one. Despite the difficulties of being a trailblazer, Wells was dedicated to her job. When the department leadership and the public saw that they were willing to accept the idea of women on the police force, other women joined the department, Taylor said. 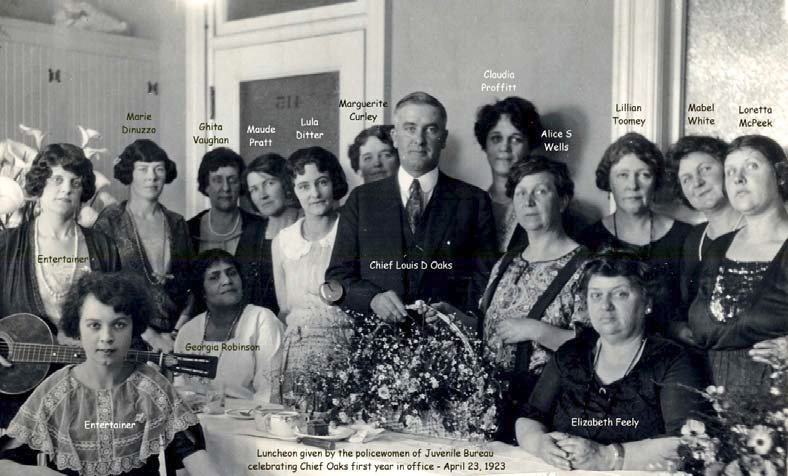 A gathering with policewomen, including Alice Stebbins Wells, in 1923. Wells traveled the country speaking about both her experiences as an officer working with minors and children and as a policewoman. In 1925 she was one of two officers who started the Los Angeles Women Police Officers and Associates (LAWPOA). Sargent Susan Padilla of the LAPD is now the First Vice President of LAWPOA. She said currently just under 19% of the LAPD's officers are female. The department has made an effort to promote and support women officers over the years, Padilla said, and that work is ongoing. In 2008, we actually had our first female in our SWAT, which is our Special Weapons and Tactics unit. 1967 was when the SWAT team was formed with the department, so from 1967 to 2008, it was all men. Air Support we have quite a few women working there now, and we have quite a few women working in our Bomb Squad, but I think we would like to see more female officers come on the job. Wells served the LAPD for 30 years before retiring. She passed away in 1957, and at her funeral there was an honor guard of ten policewomen.